War is the watchword of many in this world. Arms have trampled aims. Battle is the spittle that comes out from man’s mouth. Fight him, curse him, kill him, chase after, catch up with him, if he outruns you, poison his footsteps. That is the new anthem of the country. No sigh of relief but mischief. There is war in the world, nation, state, city and society. Our streets are greeted daily by cries and gnashing of teeth. Our homes are homicidal, there is trouble everywhere, everyday even in our minds. We sleep with our eyes widely opened. If we can’t reign peace, can’t we let peace reign? Newton’s Law – every action attracts reaction. If a fowl pours away my drug, I’ll break its eggs. Law of Karma. What you sow is what you shall reap. No one is expected to sow yam and reap orange. “Do me, I do you”. Evils for evils. Madness for madness. War is what we want, we pieces peace and opt for war. Where do we keep tolerance, perseverance, negotiation, reconciliation? We tend not to understand the common proposition of Wilson Churchill: “It is always better to jaw-jaw than to war-war”. To “jaw-jaw” is to talk lengthy, to discuss, rub minds and negotiate, to agree to disagree and to disagree to agree. That is, to negotiate is always better than to have war. Things are tense in essence. Fowl now eats the intestine of fowl. Man kills man. No love among lovers but lust. There is economics in saying the truth. Illegal tender outmanoeuvres our legal tender. Love for money overshadows love for God. Selfishness versus selfishness. City is hot. Our land that used to flow of milk and honey now flows of the innocent blood. Animated human beings are dehumanising humane humans. All ways to the promised land are blocked – there seems no way. There is a way anyway, but we have refused to foot it. When a load spurns the sky and scorns the land, we place it somewhere else, don’t we? The only way to end these troubles is to make peace_ to jaw-jaw not to war-war. Genocide is ruining Myanmar. The Buddhist terrorist is the new Adolf Hitler, killing massively. No peaceful area in North and South Korea. America is bullying co-countries. Xenophobia is the only way South Africans could pay back other Africans. In my country, the noise of war is deafening our ears. Nnamdi Kanu is the Ojukwu of this time. The rattled snakes of the 1967 civil war are provoking venoms of secession. They say they want “Independent People of Biafra”(IPOB). 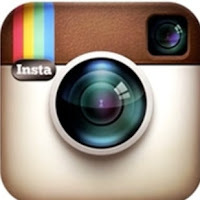 Redlines are the headlines of our social media platforms. The fire of Boko Haram is yet to be extinguished. Evans, a notorious kidnapper is being celebrated while in detention of the police. While the poor pray to be rich, the rich prey the poor. There is war, war everywhere. If peace cannot make the world, let the world make peace. Peace and only peace can save the world. “Returning hate for hate multiplies hate, adding deeper darkness to a night already devoid of stars. Darkness cannot drive out darkness; only light can do that. Hate cannot drive out hate; only love can do that. Hate multiplies hate, violence multiplies violence, and toughness multiplies toughness in a descending spiral of destruction”. The above are words of Martin Luther King. If truly we want peace, military should not be tooled to fight militants. Hate speech should not interlude hate speech. We do not have to pay evils for evils. He that beats the drum for the mad man to dance is no better than the mad man himself. He who betrays those that betrayed him is also a betrayer. An eye-for-an-eye principle cannot save us from the war of this world. When talking about an “eye for an eye”, Jesus, taught us to turn the other cheek during the Sermon on the Mount. He preached to His disciples in the Good Book: “You have heard that it was said – ‘An eye for an eye and a tooth for a tooth’. But I say to you, do not resist an evildoer. If anyone strikes you on the right cheek, turn to him the other also. (Mt 5:38–39). That is peace, peace-making in its real sense. Whenever the infidels frequented in tormenting Jesus, he would say: “Father forgive them, because they don’t know what they are doing “. That’s exactly how to make peace or make it reign. The creeping of a lion is not of cowardice. A gentle chameleon was queried why he walked without thud. He said it was because he did not want the earth to cave. Just to let peace reign, we have to prefer to jaw-jaw than to war-war. Waging war against war cannot end a war, only peace can do that. Let us make a difference, we should not all sleep and put our heads all in one direction. Peace is possible in this world, only if we reign it or let it reign. Above all, the wars around us in the world are infinitesimal compared to the one in our minds. War of the mind is the greatest. Unless we win the war in our minds, the conundrum of how to win the war in this world would remain riddled. When there is peace in our minds, there will be peace in our homes, cities, societies, states, countries and the world at large. If the war that preoccupies our minds are defeated, the rat shall hiss like rat; the bird shall chirp like bird; human shall speak like human; our land shall flow again of milk and honey; the farmers shall harvest abundantly; despite our ethnical, religious, linguistic, traditional differences, we will live together both peaceably and peacefully and there shall be peace everywhere. John Kennedy had rightly said: “If mankind will not end war, war will end mankind “. 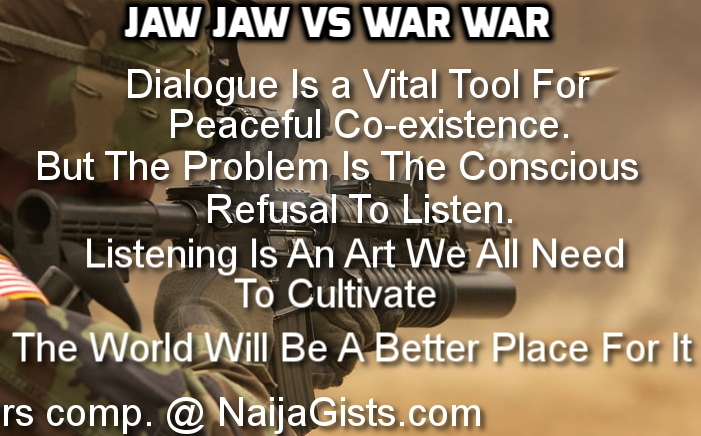 This is a piece of peace: jaw-jaw; don’t war-war. Olarotimi writes from Usmanu Danfodiyo University, Sokoto. When I was read this, it come to do me like say is a poem weyris this. This persin weyris write this is a knower of something o. I am also a knower of something weyris even big pass away this persin weyris write this. See the highest poem wey I have write. It is best pass away all the highest poem I have write. It talk about of pipuls weyris die so that pipuls weyris never die is know say one day is to die. So that they are not live life anyhow they are want bicos is not forever to be here. Is one they to die and go and another somebody is borning again by woman to take your place. See the poem here. I am not biliv say na me write am bicos the poem too good. It be like wetin Wole Soyinka or China Achehe or Bagrib Wassa write. See the poem here. Are you think say you fit catch the thief? We are see flower weyris grows for tree. But the flower is dry and is fall from tree and is burning into fire wey be say na odinary matches cause am. Are we not learn lesson? And night is follow am. And when night have waka come, pipuls must sleep. Na sweet poem o. I de plan to dash am Wole Soyinka. beautiful piece I really love it. BENCH,WILL NOMINATE U AS THE NEXT LAUREATE LITERATURE WINNER FOR COMPOSING THAT GENRE.MANS INHUMANITY AGAINST THEMSELVES.GREED AND MONEY MAKING VENTURES ARE PART OF THE CONSPIRACY.DIVIDE AND RULE IDEOLOGY ETC THUMBS UP TO WRITER,PLS DRUM IT INTO SULTANS EARS IN HIS SOKOTO CALIPHATE SINCE U RESIDE THERE AT THE MOMENT. Nice write up. Kudos to the writer!! !